Dark Souls, developed by From Software and published by Namco Bandai, is the spiritual successor to 2009 sleeper hit Demon’s Souls. Like its predecessor, Dark Souls is a challenging experience that rewards patience as well as trial and error to complete. It also boasts gameplay changes and a multiplatform international release. Unfortunately the experience is marred by an inferior online component than Demon’s Souls, as well as frame rate issues. Even with these problems though, it is an adventure worth undertaking just prepare to die a lot. Dark Souls weaves an interesting tale that is told passively rather than through cut scenes and exposition. The story starts with a land of nothingness ruled over by all powerful dragons. Out of the nothingness fire sprang up and from this eternal flame four powerful souls were born. Four beings collected these souls and defeated the dragons ushering in the era of fire. This era was not to last and the fire diminished and a mysterious undead plague broke out throughout the land. You, as the chosen undead must end this plague and usher in a new era. 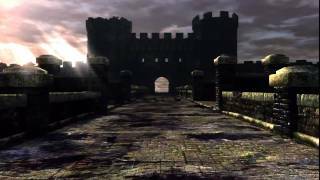 This recap is about all the story you get with Dark Souls, and is told in the opening cut scene. Instead the player has to read item descriptions and talk to NPCs multiple times as well as with different items in their possession to uncover the secrets of this game’s narrative. Even with these tidbits of information a lot of the story is still up to interpretation allowing different perspectives depending on the player. Dark Souls’ story is an interesting one just be prepared to work for the tale rather than sit back and take it in directly. The meat of the Dark Souls’ experience is through its engaging gameplay and customization. The player is given the option of creating their character to their liking through customization, class section, and choice of a starting item. Your character then levels up through the use of the end game currency, souls, and allocated various stat points. This allows you to mold your character into anything you want; ranging from a fire throwing knight to a magical enchanted archer. There is also a robust weapon creation system that allows you to enhance most weapons to synergize with your character. Weapons also have differing move pools and swing speeds that allow you to choose, which weapon fits your play style the best. All this allows a great deal of customization as no build is the best and it really allows you to create a character that fits how you play. Dark Souls’ also has a great deal of replay value. There are multiple endings and a new game plus mode that allow you to play through the game again with all your armor and equipment, but with significantly stronger opponents. The core gameplay component of Dark Souls is the battle system and exploration. Combat system rewards patience and careful timing to succeed. Dark Souls’ is not a button masher first and foremost. The character has a stamina bar that depletes when they block, roll, dodge, or attack. Once your stamina is depleted you are open to attack, which leads to certain death. This gauge refills slowly when blocking or fast when standing or moving normally. This adds a great deal of depth to fighting as you can’t just block every attack or roll around forever; you also have to be wary on when to attack as it can leave you defenseless. You are also able to parry and back stab an opponent, which rewards precision and timing. All of these actions are smooth and responsive, resulting in a very polished fighting system. Dark Souls’ also rewards exploration with hidden items and souls. Many deaths will not only result in from monster encounters, but also environmental deaths as the terrain can be just as difficult to surmount as a wave of enemies. Falling boulders, fire breathing dragons, invisible walkways, and narrow bridges are only a handful of environmental challenges you may experience. Some of these traps are impossible to foresee so trial and error does play a major factor. All these components mold together to create a punishing video game where deaths range from being slaughtered by zombies to being hit by giant boulders. The game also features an engaging multiplayer system that adds a new dimension of challenge to the game. You can play the game alone, but at any time you can jump into the multiplayer. Once online you are able to write and see messages left on the ground that give hints and advice. You are also able to summon other players to aid you through your journey. The most engaging part of the Dark Souls’ online component is invading. Anytime you are human you can be invaded by other players. These players will hunt you down and do anything necessary to kill you and make your life miserable. This fear of being invaded gives a whole new twist on the challenge of Dark Souls. Unfortunately the servers this game utilizes are peer to peer instead of the dedicated servers Atlus used for Demon’s Souls. This means that it can be hard to find other players to play with and messages can be very sporadic. When the multiplayer does work it adds a whole new element to the game, which increases the value rather than detracts from the overall package. >Dark Souls has an impressive art direction and level design that is marred with frame rate issues and slowdown. Each level is unique and mysterious in its own way. As you play through this game you will stop and look at the beautiful yet dreary scenery and marvel in the creativity. These levels range from an underground lake surrounded by ash to a fallen city sinking into darkness. Monster models are also creatively designed and feel different, with unique creatures in most of the new areas you visit. Dark Souls’ aesthetic is beautiful and will appeal to the most dark gothic horror enthusiasts. This experience is brought down by a few minor technical problems. In areas with large monsters or detailed environments the game experiences frame rate issues. In the most heavily populated areas, major slowdown can occur that really hampers the experience. Luckily this only happens in a few select areas of the game for brief amounts of time. The game also has good voice work and a strong orchestral soundtrack that really adds to the atmosphere. Dark Souls is a unique experience that rewards patience and careful exploration. The story is engaging and is backed up with strong gameplay and customization. The aesthetic and design choices create a strong atmosphere that gives a sense of hopelessness. Unfortunately there are minor technical problems resulting in unstable framerate and slowdown in some areas of the game. Dark Souls ultimately manages to live up to the strong pedigree of its predecessor Demon’s Souls. If you are a fan of From Software, Demon’s Souls, or challenging games in general, go out and buy this game. 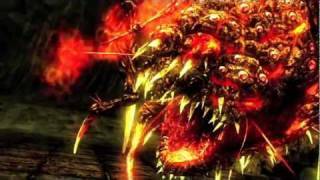 Dark Souls has a gothic horror aesthetic that comes through in its unique level and monster design. Each area is different and is mostly populated with varying creature types. Textures are crisp and clean, adding to the atmosphere. Gameplay is challenging and punishing, rewarding the careful. There is also a large amount of customization allowing you to create the perfect character for your play style. This is further expanded upon with multiple weapon types that have varying mechanics. The single player component of Dark Souls is engaging and enjoyable. Playing alone is challenging, but fair allowing you to rely on your wits alone. There are also multiple endings and a new game plus mode that gives this game strong replay value. Multiplayer adds a whole new spin on Dark Souls. Allowing you to summon aid or even be invaded by fellow players adds anxiety to the experience. Multiplayer does suffer from P2P servers, sometimes making finding other players challenging. The game has a few performance issues. There are notable frame rate problems with large monsters and elaborate zones. A few zones in particular have some slowdown which really detracts from the overall gameplay experience. Dark Souls is a challenging experience that rewards the patient and those who are willing to endure the punishing difficulty. Gameplay is tight and responsive and allows for creative customization. The aesthetic and design choices augment a world of hopelessness and dread. If you can get past the minor technical problems and enjoyed Demon's Souls, give Dark Souls a try.